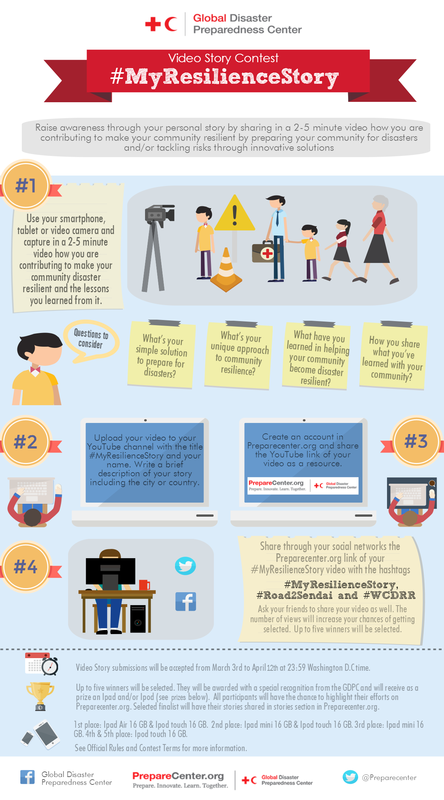 The Global Disaster Preparedness Center (GDPC) piloted the #MyResilienceStory video contest from March 3rd to April 12th of 2015 to raise awareness on how local efforts and actions are contributing to community resilience. Through this initiative, the GDPC highlighted disaster preparedness efforts and best practices of disaster risk management around the world by showing how volunteers and disaster practitioners are working towards resilience through simple actions that help individuals and communities prepare for disasters. Building on this experience with the video story contest, the GDPC is planning future rounds of the #MyResilienceStory contest to enable local champions of disaster preparedness and resilience to tell their stories on how their approaches are making their communities resilient. Raise awareness through your personal story by sharing in a 2-5 minute video how you are contributing to make your community resilient by preparing your community for disasters and/or tackling risks through innovative solutions. 1. Use your smartphone, tablet or video camera and capture in a 2-5 minute video how you are contributing to make your community disaster resilient and the lessons you learned from it. 2. Upload your video to your YouTube channel with the title #MyResilienceStory and your name. Write a brief description of your story including the city and/or country. 3. Create an account in Preparecenter.org and share the YouTube link of your video as a resource. 4. Share through your social networks the Preparecenter.org link of your #MyResilienceStory video with the hashtags #MyResilienceStory, #Road2Sendai and #WCDRR. Ask your friends to share your video as well. The number of views will increase your chances of getting selected. Up to five winners will be selected. o Prepare: What’s your simple solution to prepare for disasters? o Innovate: What’s your unique approach to community resilience? o Learn: What have you learned in helping your community become disaster resilient? o Together: How you share what you’ve learned with your community? · All participants will have the chance to highlight their efforts on Preparecenter.org. · Selected finalist will have their stories shared in stories section in Preparecenter.org. · All stories submitted will agree/consent to have their videos shared on our website and on our YouTube channel. · The GDPC may approach any of the contest participants to further collaborate with them and develop a case study about their innovative approach to resilience. · The winners of the contest will be notified via email and they will need to submit their address so the GDPC can send the granted price. · Participants can submit just one video, either as an individual or a team. However, just one prize will be awarded per participant or group of participants. · Videos should be submitted in any of the following languages: English, Spanish, French, Portuguese, Arabic, and German. · Participants don’t need to be affiliated to any Red Cross or Red Crescent Society to participate in this contest. See Official Rules for restrictions that apply. Para español de clic aquí / For Spanish click here. Pour française cliquer ici/ For French click here. The Global Disaster Preparedness Center (GDPC) is a resource center that promotes innovation in disaster preparedness and supports research and knowledge sharing amongst disaster preparedness professionals worldwide. Established in 2012 by the American Red Cross and the International Federation of Red Cross and Red Crescent Societies, the primary aim is to strengthen the disaster preparedness capacities of the global Red Cross and Red Crescent network in order to help safeguard communities from future disasters. Resilience is defined by the IFRC as the ability of individuals, communities, organizations or countries exposed to disasters, crises and underlying vulnerabilities to anticipate, reduce the impact of, cope with and recover from the effects of adversity without compromising their long-term prospects. is knowledgeable and healthy, with the ability to assess, manage and monitor relevant risks while learning new skills to better address these while tapping collective experience. is organised. It has the capacity to identify problems, establish priorities and act. has infrastructure and services. It has strong housing, transport, power, water and sanitation systems. It has the ability to maintain, repair and renovate them. has economic opportunities. It has a diverse range of employment opportunities, income and financial services. It is flexible, resourceful and has the capacity to accept uncertainty and respond (proactively) to change. Click here to know more about the UN World Conference on Disaster Risk Reduction (WCDRR), the GDPC's participation at the WCDRR and how to get involed with the WCDRR.